Today, we’re giving away the recently updated 6×6 app. 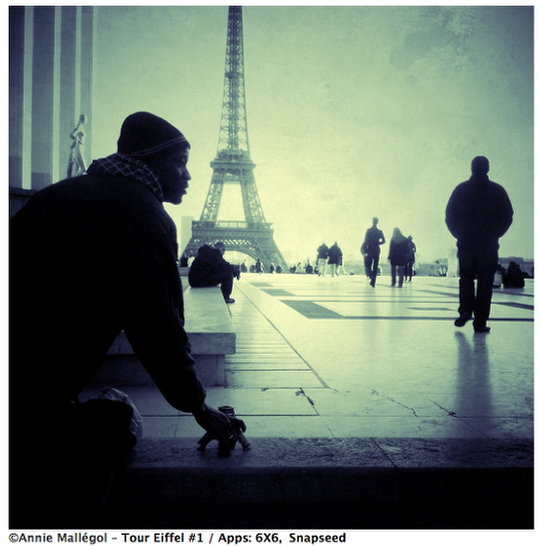 6×6 is one of the most popular mobile photography apps available for your iPhone/iPod Touch. Many of the mobile photographers that we have interviewed here at theappwhisperer.com use this app on a regular basis. Including one of our favorite Parisian street photographers, Annie Mallégol and the image below is one of hers, taken with 6×6. We interviewed Annie last summer, if you missed that, you can read it here. Would you like to try it for free? Join our ever expanding Twitter followers and Facebook fans, RETWEET THIS POST and send a reply to the bottom of this page telling us what you love most about theappwhisperer.com. We will select winners at random from the selection of codes that we have and send them directly to your email box. @theappwhisperer is my go to for the latest news. Keep it up Joanne! The AppWhisperer is my favorite blog for everything about iDevices photography. Thanks for the giveaway. I wish I could make something that looks half as beautiful as Annie’s works. @AppWhisperer ( we know who you are )adding this would probably complete my tool kit for image making. Maybe I could then join Annie Mallègol in a remake of Le Jetee! Ahh, Paris in April! I like the interviews and tutorials! Thank for the giveaway and chance. 6×6 is my favorite camera app by far. Easy, intuitive, great IQ. If only 645Pro were this uncluttered! I follow you on Facebook, twitter and on mobitog, like your posts, interviews etc. I think I missed this great giveaway… but thanks for the opportunity! I love all these giveaways!